ECRs are manifestations of modern society in which three social paradigms, i.e., informational society, risk society, and surveillance society, appear to converge. These scenarios are closely related, even mutually reinforced, and each immensely facilitated by ICTs. The focus of each of these phenomena is different though. The informational society generally has—despite the risks associated (for example, in areas of privacy and security)—a more positive connotation than the other two. The informational society holds opportunities for innovations that generate convenience and freedom, whereas the other two stem from negative premisses, like controlling potential risks and watching over individual behaviour to prevent exigencies. The risk society and the surveillance society present opportunities for those who manage risks and are in charge of surveillance. From an individual’s perspective, these societies are often qualified as lacking personal freedom, privacy, and transparency. 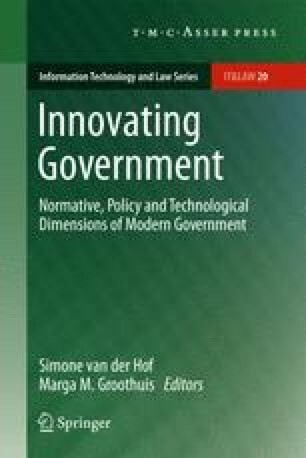 Overall, social changes reflected here denote an apparent belief that we can engineer society through government policies so that social problems will disappear (termed ‘maakbaarheid van de samenleving’ in the Netherlands). Each of these scenarios will be briefly sketched in light of ECRs.